In 2005 we started an ambitious project: introducing timeless, classical music into the seemingly less-fit environment; at least according to common prejudices that unfortunately abound. You who read this, may have a picture of a beautiful Greek Island in the midst of summer holidays and all the razzmatazz usually associated with it. Now you may want to think of this: what we offered went against all such preconceptions: Instead of a seasonal beach bar complete with loud speakers and dancing parties, half-drunk with cheap alcohol, we offered classical music pieces in a majestic theatre and concert hall in the midst of Hermoupolis, the "grand lady" of Cyclades. Instead of your usual resident DJ or – even worse- generic playlist thumbing monotonous "music" out of monster loudspeakers -so as to drain people from emotion and thought - we offered the top international performers of Beethoven, Bach and Mozart. We offered peace, serenity, introspection and tactile emotions in equal measures. Despite or perhaps, because of this, our project was met with indifference from national sponsors so eager at other times to be associated with projects conforming to their marketing-infested stereotype of summer Greece and, by the way, offering wide exposure. Even more lamentable, the so-called “artistic” community of Greece also turned a blind eye, preferring instead to mingle with the rich and famous and enjoy free of charge vacations offered in their pharaonic mansions currently littering the Aegean landscape. We were accused of "not being modern", of "going against the grain", of being "obsolete" and - oh mother of sins!- "out of fashion". And yet... With the selfless assistance of the open – minded local authorities of Hermoupolis-Syros and thanks to the fierce loyalty of our followers, the 14th Classical Music Festival will take place! Once again it will strive in providing high quality artistic pleasure to its attendance and exquisitely pair the timeless masterpieces of classical music with the light of the Aegean summer and the freshness of the sea breeze for those wishing to soothe themselves with such delectable pleasures and disassociate from the crass noize and the cheap pseudo – escape offered by your run – of - the mill beach bars and cheap cocktails. 14 years have passed since we started our bold venture: this is not the beginning of an experiment; it is an experiment for a new beginning: of making Syros, the Cyclades the Aegean a place associated with Art, light and hope. We are classic. That is why we are modern. And it would give us the greatest pleasure and happiness if you joined us. 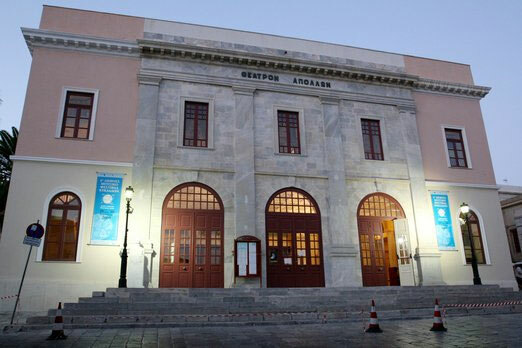 The festival is being housed at the unique "Apollo" theater in Hermoupolis and realized under the auspices of the Cultural Center of the Municipality of Hermoupolis,the capital city of Syros. In August 2014 the ICMFC celebrated its 10th anniversary and the 150 years from the inauguration of Apollo Theatre of Hermoupolis, with a saying by Hippocrates of Cos (460 – c. 370 BC), an ancient Greekphysician of the Age of Pericles (Classical Greece), "Ars longa, vita brevis", an expression that perfectly describes what has been achieved in the festival's first decade.